Beeston with Bittering is a large parish located in central Norfolk, about 5 kilometres northwest of East Dereham. Originally two parishes, Beeston and Bittering were united in the 20th century. They were not immediately adjacent, with Bittering located just to the northeast of Beeston. This means that the modern parish has a peculiar shape. The present settlement pattern in the parish is generally one of scattered houses and farms, with the central Beeston village the only large concentration. Stray finds and archaeological investigations ahead of extensive gravel quarrying mean that considerable evidence for prehistoric activity and occupation has been recovered. Prehistoric artefacts recovered by chance include flint axeheads, polished flint and stone axeheads, flint scrapers, flint flakes and a flint arrowhead. Important evidence for Neolithic and Bronze Age settlement has been excavated (NHER 13023, 15910 and 15995) in the northeast of the parish, alongside the Bittering stream. Features found include groups of pits, ditches and gullies, while finds include flint artefacts and pottery. Excavations at an adjacent site in Longham parish (NHER 13025) show that activity also took place to the south. At least four scatters of burnt flint, possible burnt mounds, have also been recorded, one was close to the settlement, with the other three located in the west of the parish. A copper alloy Late Bronze Age socketed axehead has been collected in the west (NHER 42601). Two ring ditches, possibly Bronze Age barrows, have been identified. Sited in the north of the parish, they are located either side of the Beeston stream. Excavation of a mound thought to be a barrow demonstrated that it was a natural mound, but discovered a burnt area and a pit that contained Neolithic pottery (NHER 15275). Excavations on the site of the Neolithic and Bronze Age settlement also discovered evidence for an Iron Age settlement. Numerous pits and pit groups, a four post granary and a row of post holes at least 110m long have been recorded, along with artefacts including pottery (NHER 13023, 13923 and 15910). The settlement evidence continued southwards at an adjacent site (NHER 13025) in Longham parish. Part of the Launditch (NHER 7235) is located in the northeast of the parish and forms part of the parish boundary with Mileham and Longham. It is a substantial ditch and bank, the surviving length of which is about 0.9 of a kilometre long. Originally it was much longer and its route has been traced using landscape features, map evidence and aerial photographs for about 6 kilometres. In the mid 20th century it was suggested that the Launditch is Early or Middle Saxon in date and an excavation in 1954 appeared to confirm this. More recent excavations, however, have opened up the possibility that it could date to the Iron Age. Whether it is Iron Age or Saxon in date, it would have been part of a larger defensive system. The Launditch is intersected by a northeast to southwest aligned Roman road (NHER 2796). This is the road between Denver in west Norfolk and Brampton near Aylsham. A possible second Roman road has been identified as a soilmark on aerial photographs. Roman pottery and artefacts have been found in a number of places in the parish, with most found in the west or northeast. At one site (NHER 4084) over three hundred Roman coins, metalwork (including a military belt fitting) and pottery have been collected. This was probably the location of a Roman settlement. A brooch and two beads of Early Saxon date have been found at sites in the southwest of the parish. A site near Beeston village has yielded fragments of two Early Saxon brooches, an Early Saxon sword scabbard fitting, a Middle Saxon brooch and Late Saxon metalwork (NHER 44099). Middle Saxon pottery was discovered close to both Bittering and Beeston villages, with a pin of the same date collected south of Bittering. Late Saxon pottery has been recovered from Beeston churchyard and village. Beeston is not recorded in the Domesday Book, although Bittering is. In 1086 Bittering was owned by William I, although there are indications that at least part of the ownership or tenancy was under dispute. It is named ‘Britringa’, Old English for ‘place of Brihthere’s people’. St Mary’s Church, Beeston (NHER 4093) and Saint Peter and Paul's Church, Bittering (NHER 7267) are both medieval churches with later elements. 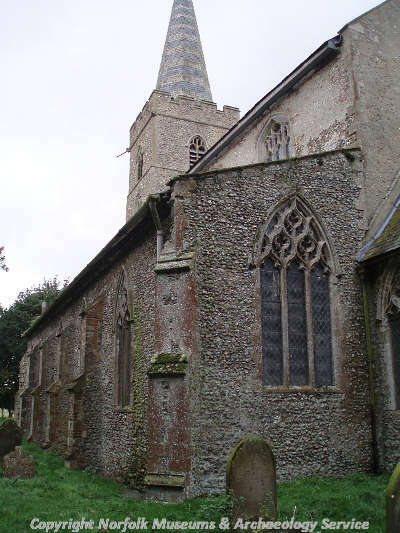 St Mary’s is in an isolated location to the west of Beeston village, while Saint Peter and Paul’s is located within Bittering deserted medieval village (NHER 7266). Six moated sites are known in the parish, with a possible seventh. One is located at the eastern end of Beeston village, with two located to the southwest of the settlement. Another is located adjacent to Beeston church, with the possible moat to the southeast. Two are located within the deserted settlement of Bittering. A medieval windmill (NHER 18227) stood where the parish boundaries of Beeston with Bittering, Kempstone and Fransham meet. Ridge and furrow earthworks survive in the northeast of the parish, while ridge and furrow cropmarks have been identified in the southeast (along with a trackway). 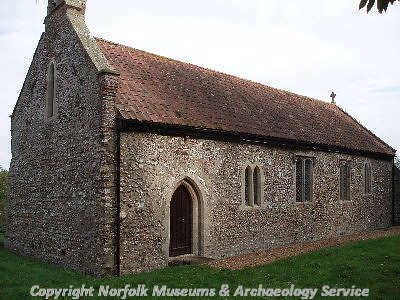 Medieval and post medieval pottery and metal finds have been discovered at locations throughout the parish. Post medieval houses in the parish include Manor House (NHER 17415), Chapelhouse (NHER 17416) and the Older Cottage (NHER 40959). The Old Rectory is an 18th century house surrounded by a medieval moat (NHER 7272). The site of a windmill (NHER 17909) is marked on a map dating to the 1840s. Elements of a 19th century brickworks, including an entrance lodge, survive in the northwest of the parish. Earthworks (NHER 30717) marking the sites of cottages, outbuildings, a well, a bank, a ditch and a quarry pit survive close to the western parish boundary. During World War Two, Wendling airfield (NHER 7275) was established and part of it was located in the southeast. A searchlight battery (NHER 36517) was built in the northwest. Two undated enclosures have been identified on aerial photographs. David Robertson (NLA), 17 August 2005.
http://norfolkchurches.co.uk/beeston/beeston.htm. Accessed 17 August 2005.